‘Sakyamuni preaching on Vulture Peak’ is one of the largest known Chinese silk embroideries thought to date to the eighth century, under the Tang dynasty (618–907). It was found at the cave temple site of Qian Fo Dong, near Dunhuang, one of the most famous archaeological sites in China, and is now in the British Museum (BM). Scanning electron microscopy (SEM) was used to investigate the state of degradation of the original and restoration fibres, which appeared very brittle in many areas. Energy dispersive X-ray (EDX) spectrometry was undertaken to give an indication of the mordants. Although the results were difficult to interpret due to elemental contamination, some indications were obtained regarding aluminium and iron mordants on the silk embroidery. Selected dyed threads were sampled and analysed using high pressure liquid chromatography coupled with mass spectrometry (HPLC-MS). The samples were representative of the entire dye palette used. In some of the areas that are now demonstrated to be extremely faded, safflower (Carthamus tinctorius) was identified. More than one source of indigotin was probably used for the blues, and the greens were obtained by mixing these with at least two sources of yellow dyes: a berberine- and a luteolin-based dye. Browns were tannin-based. Two sources of reds were also present: a plant of the Rubiaceae family and a currently unknown red source. The presence of shikonin, probably from gromwell (Lithospermum erythrorhizon), was revealed in a purple stripe in mixture with sappan wood Caesalpinia sappan (Biancaea sappan) to obtain a particular hue. Other molecular components were often present with the main dyes and tandem mass spectra were acquired in an attempt to elucidate their structures and discuss the possible reasons for their presence. 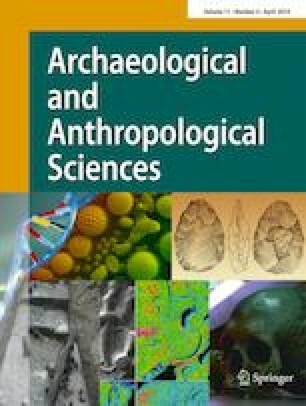 This work represents an important addition to the current knowledge about Chinese dyes and available mass spectral data for the identification of dye sources in archaeological textiles from the Silk Road. The online version of this article. ( https://doi.org/10.1007/s12520-017-0592-4) contains supplementary material, which is available to authorized users. The authors would like to thank the Queen Elizabeth Scholarship Trust (QEST) for funding Hannah Vickers’ internship at the British Museum. The conservation work was also supported by the Idlewild Trust, the Thriplow Charitable Trust and the Nara National Museum. Monika Harter (former Head of Organics, Department of Conservation, British Museum), Yu-Ping Luk (Curator, Asia Department, British Museum) and Jane Portal (Keeper, Asia Department, British Museum) are thanked for their involvement in the project and useful discussions. As an Andrew W. Mellon Postdoctoral Research Fellow, Diego Tamburini would like to thank the Andrew W. Mellon Foundation.